If being placed into some people's choice for the "Group of Death" in this year's World Cup with the Czech Republic, Italy, and Ghana wasn't bad enough, the US Men's National Team now needs to overcome the Sports Illustrated cover jinx for the second world up in a row. 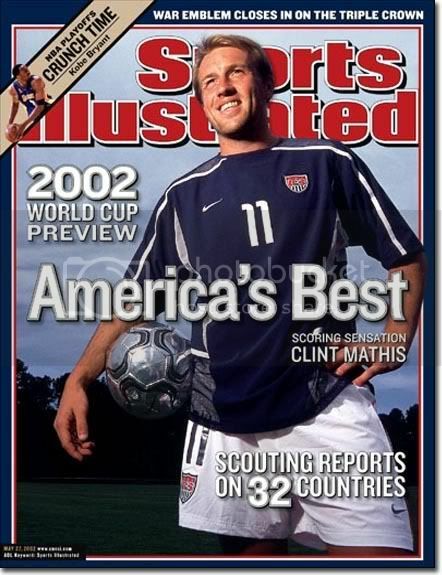 Clint Mathis was the SI cover boy four years ago. Now it's a team effort with Landon Donovan, Demarcus Beasley, Oguchi Onyewu, and Bobby Convey getting the honor this time around. Perhaps the fourth time that US Soccer has gotten a full SI cover will be a charm? It certainly didn't seem to hurt the US in Japan/Korea in 2002. 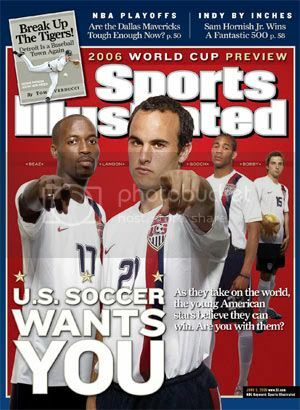 Although, perhaps the Landon Donovan cover after the US ousted Mexico was to blame for the US' quarterfinal loss to Germany? Hopefully the members of the US squad aren't as superstitious as I am! Most US fans know that USSoccer.com is the place to go for the best coverage of the US National team. From the all access video to the podcasts to the soon to be launched Studio 90 daily webcasts, the US Soccer Federation's website does it all. But, there are other places to go for good info about Team USA and here are some of my favorites. US Defender Jimmy Conrad has been writing articles for a while. His latest has some great stuff about both the fitness test at the USMNT's camp in Cary, along with the stress of waiting to find out if he made the team. My favorite part was the joke that Landon Donovan played on him an hour before the announcement. US starting goalkeeper Kasey Keller has a blog over at CBS Sportsline. While not as funny as Conrad's stuff, it's still pretty solid. The only thing I'd mark him off for is the over the top pimping of Puma, his big sponsor. Sam's Army's website is cool because you can customize the layout exactly the way you want. And it will give you all sorts of links to new articles about the US squad. Yanks Abroad focuses mainly on American players playing for club teams abroad. But, I'm expecting their coverage of the World Cup to be top notch. ThisisAmericanSoccer.com and Nike Soccer's Don't Tread on Me site go hand in hand for me. And I have to say, the latest Joga Bonito ad featuring Team USA is even better than the Gatorade "Take Me Out to the Ballgame" ad.